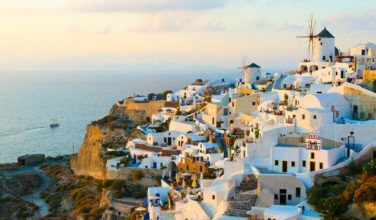 Skala is the main town on Patmos island and is where most of the hotels, shops, and nightlife is concentrated. There are also plenty of gorgeous beaches nearby. If you’re staying on the island for an extended period of time, it is a good idea to stay in or near Skala because there is a lot to do here! If you arrive to Patmos by boat, chances are pretty good that this is where your Patmos journey will begin, too. This Medieval Era monastery looms over the town Skala like a fortress. 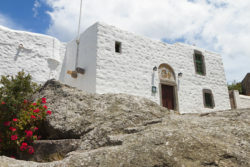 Patmos is known as being the island where Saint John penned the Book of Revelations in the Bible and it therefore has important religious significance to Christians. Historically, the monastery is a fortress of sorts. Even though it houses monks, it was also built to discourage pirates from wreaking havoc on the island in the Medieval time period. Today, it also helps prevent tourism from completely controlling the island. It is for this reason that, despite the island’s popularity, it continues to be a quiet sanctuary for visitors. Don’t miss the Chapel of the Theotokos, which has an impressive collection of frescoes from the 12th Century. 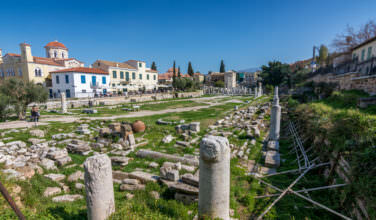 When Dormitian exiled Saint John from Rome, the emperor at the time, it is well known that he fled to the island of Patmos where he eventually wrote the Book of Revelations, the last book of the Bible. Since this is the book that talks about the biblical apocalypse, this cave, which is believed to have been his home on the island, has been dubbed the “Cave of the Apocalypse.” Because of its biblical and historical significance, people come from all over the world to visit it and pay their respects. Philip Argenti, the 20th Century historian from Chios, had an impressive and eccentric collection of artifacts from around the island of Patmos. He was an aristocrat, as well, and the museum is also a reflection of his wealth. Besides housing various folk objects and artifacts from Patmos, there is also an impressive replica of a popular painting that depicts the Massacre of Chios. The original painting can be found in the Louvre museum in Paris. This is a great place to get an overview of the culture and folk history of the island. 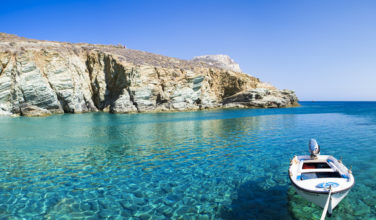 Besides visiting these attractions, Patmos is a typical Greek island that has a delicious local cuisine, gorgeous weather, and pristine beaches. It’s definitely a great place to relax!